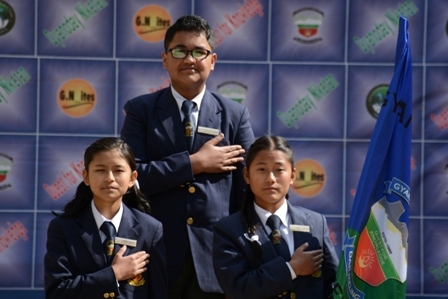 The School held the Investiture Ceremony on the 20th of February. The Investiture ceremony marked a significant beginning of the new academic year. It was a solemn occasion where the young students were all prepared to take the mantle of leadership and discharge the responsibilities entrusted upon them by the School. To inculcate the leadership qualities in students and to give them a feel of leaders and a sense of responsibility the new �Prefectorial Body� is formed every year. The various posts were announced and were presented their badges, respective flags and the oath of office was administered to the elected members.